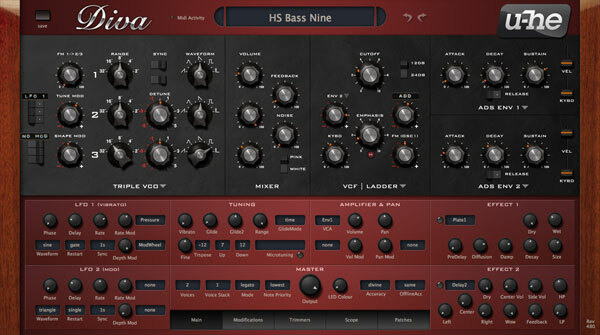 This version of Diva has a preliminary GUI for the Digital Osc and Uhbie filter. Please do not post screenshots without that disclaimer! Actually, we've just gone 1.2 - no major feature news (yet), but VST3 support, VST2 finally 64-bit on Mac too and many, many things fixed or improved! We're happy to announce that as of today, Diva officially bears the 1.1 version number. We'll send newsletters and press releases on Monday, as Friday is usually a bit too late in the week. - use presets that sound different in "draft" and "divine"
- set all Diva instances to "draft"
- set Offline Render to "same"
- set Offline Render to "best"
Note: Some hosts such as Reaper have a "notify plugins of offline render status" option. This must be on. swapped yellow "!" for less obtrusive "M"
Also, pre-order/introductory offer is on: click here! Some exiting news! I think the UI design is far enough to give an impression. While a few labels are missing and out of place, you can clearly see the structure. It's a rather big ui, but it will be scalable down to 70% (half the size) and up to 150% (twice the size) in small steps of 10% without loosing its sharpness and readability. At least, that's what we've planned. At the moment it is a little synthesizer plugin which I use to test and develop various modules. It's a ugly, it's grey and it's a nuissance to use. What it does though, it contains various models of selected modules from selected synthesizers that recently pile up in my place. Over the months whenever I bought or borrowed a synth, I have immediately started to analyse oscillators, filters and envelopes. From that I have often built my own versions, based on circuit schematics, hearing and measurements. Just to see if it's doable and how they'd fit in Zebra, ACE and or Berlin Modular. Other times I just mangled some stuff in Zebra to find out how it's done. Slowly arised the notion that my testing environment would make a great product all by itself: Simple, retro, beautiful - if only a proper user interface was plopped around it, and if maybe all those geeky knobs would vanish. And if I ever managed to throw all those algorithms in the same project folder. Do ACE/BM users need this? - Nope, not really. Do Zebra users need this? Nope, not really. Diva will be a subset. Merely a beginners synth. A small little gem with hopefully a lot of personality! Last edited by Urs on Wed Oct 23, 2013 9:04 am, edited 27 times in total. +1 -- Hands down, that's THE BEST use of that overabused word ever. As MaxSynths said, Bela D Media has their DIVA library. Well, actually it's called DIVA Revamp now. But written with caps nonetheless. Yeah, hmmm... female vocalist samples... can't reach the website... won't be in my Diva (which I happily write with small letter, no prob). dhalfen wrote: +1 -- Hands down, that's THE BEST use of that overabused word ever. A learner synth would be right up my street right now. mcnoone wrote: When will it be available? At some point. As I said, no haste... and some of the machines I'd love to have her impersonate havn't even arrived yet. Urs wrote: Yeah, hmmm... female vocalist samples... can't reach the website... won't be in my Diva (which I happily write with small letter, no prob). Hm... Clock DiVA maybe? Just to make it even more confusing for customers.